Written by Johann Hannesson on April 16, 2017 . What is a task? We’re defining a task as anything you can trigger in Customer.io that requires us to process a lot of data and potentially put in a queue if you’ve performed several in a short period of time. This includes large newsletter sends, building segments, and updating delays or time windows with a lot of people in them. 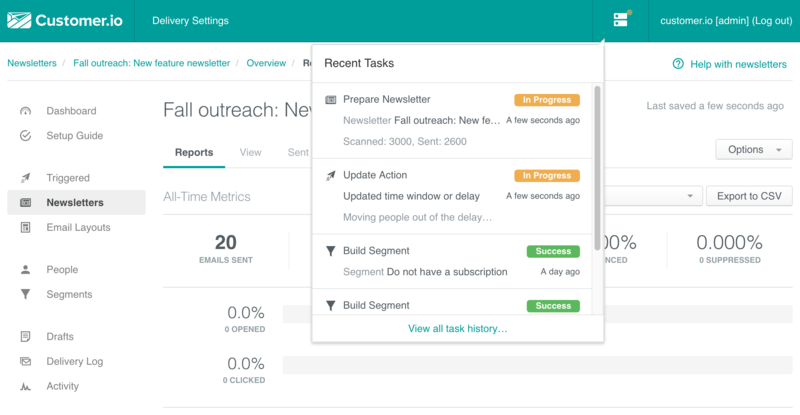 Until now you didn’t have a good indication of how tasks like sending newsletters or building segments were being prioritized if they we’re started around the same time, or when certain tasks we’re being queued behind others. Now you can see exactly what’s happening at any given time. The indicator on the Tasks icon will pulse to let you know if any task is in progress or queued. Just click on the icon to reveal more info. In the dropdown you can see what tasks are currently in progress or queued up, when it was last updated, and progress descriptions for some tasks to let you know how far along they are. Clicking on a task in the tasks dropdown will take you to an expanded detail view of that task with more information on when it was created, queued, and how long it took to complete. Note: With our new infrastructure you’ll notice a lot of these tasks are much faster than they used to be. You will also see the task history of your account from this view and can quickly get a sense of whats happened recently, or check out details on other tasks. This is one of the first features launching with our new infrastructure. If you don’t see it yet don’t worry! Tasks will be available immediately after your account is migrated. We’ll be working to refine and improve the information available for each kind of task over time. Have more task details you want to see? Send us a note to let us know! Questions, feedback, or need a hand? We’re here for you at win@customer.io. !